If you’re a regular reader of The Travel Hack you will have noticed that I love baby-wearing. Anything that keeps George happy and quiet (and preferably sleeping!) is a winner in my book. 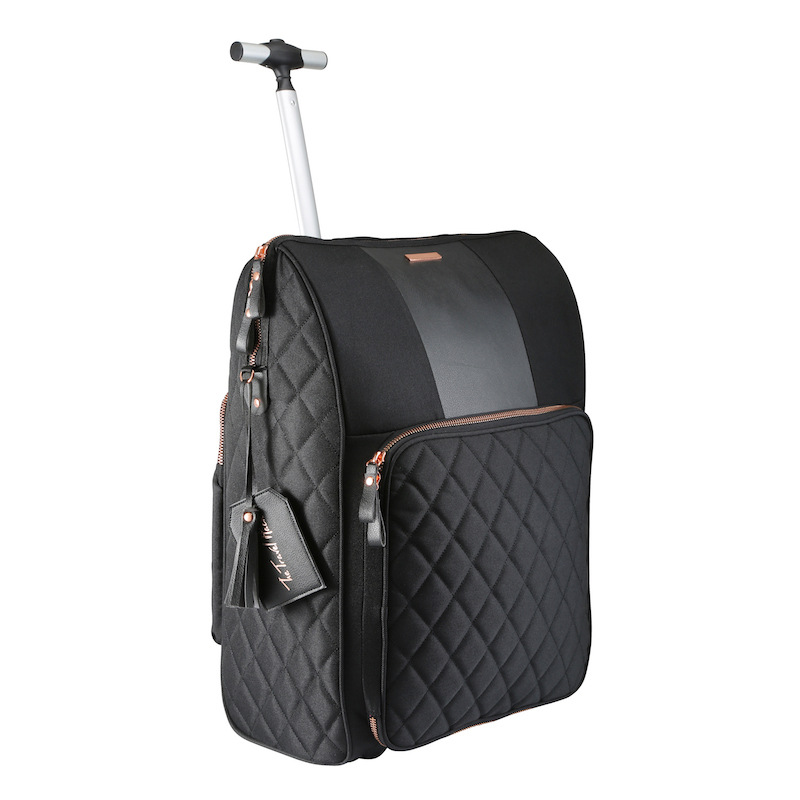 Baby carriers are especially awesome for travelling because you don’t need to bother with a bulky pram and you’re not restricted to pushchair friendly surfaces. 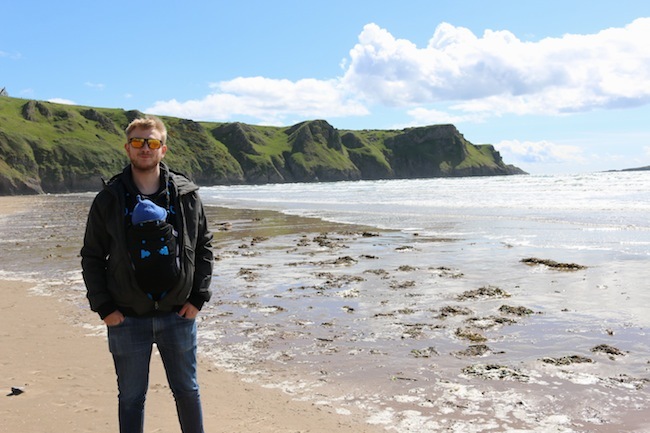 We’ve been in Swansea this weekend and it would have been impossible to do half the things we did without a baby carrier. There wouldn’t have been any walks along the beach, even the coastal paths would have been difficult. 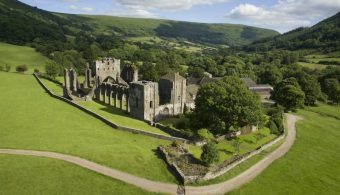 When visiting the castle we would have had to take it in turns climbing the turrets and shopping in boutique stores is easier without a pram. When George was a newborn I carried him everywhere in the Lalabu Soothe Shirt. This was great while he was teeny tiny but he’s almost outgrown it so it’s time for an upgrade. For the past few weeks we’ve been using the Pao Papoose from We Made Me. This is a super adjustable baby carrier that allows you to carry your baby on your front or your back. Not only that, but in the front carrying position your baby can face forwards or backwards. Yey! The first thing I love is the fact that anyone can wear it. With the Lalabu Soothe Shirt, only I could wear it so Sam (Daddy) ended up feeling very left out. And even better, it’s really easy to adjust the Pao Papoose to fit different people. If you wanted to switch over so someone else was wearing the Pao Papoose while you were out and about, you could easily do it without any fuss. A lot of people have commented on the Pao Papoose and questioned whether or not it was comfortable or if my back hurt while holding George for so long. The answer is that I honestly feel like I could wear this all day long. George currently weighs 13lb and if I carry him in my arms they’ll be aching in no time. But his weight is evenly spread with the Pao Papoose and I don’t have any discomfort in my back or shoulders. George can’t slip or slide anywhere while he’s in the Pao Papoose so I feel 100% confident carrying him. At the same time, I don’t feel like he’s strapped so tightly to me that he can’t move as he does have some much-needed wriggle space. The Pao Papoose can be used for babies from 12-33lbs. It says that’s aged from 4-36 months but George was 12lb by 2.5 months so I had him in it right away. I can’t say much about this just yet because George is too small to be worn forward facing or on my back. At the moment he faces my chest and loves being close and snuggily. Just like with the Lalabu Soothe Shirt, as soon as George is in this carrier he goes straight to sleep. If he’s getting cranky and he’s due a nap, I pop him right in and he’s asleep in no time. 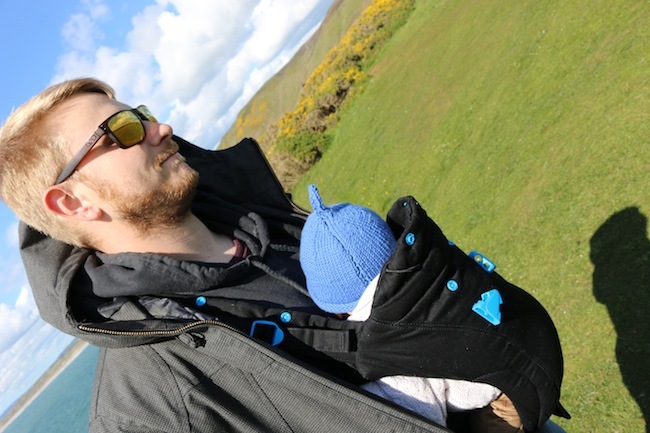 The Pao Papoose also has a detachable sun guard which is pretty handy when you’re out and about. Does anyone else find that sun hats will not stay on their baby!? It also doubles up as a handy crumb catcher. Try wearing this while eating a sausage roll and you’ll understand why it’s so handy! Everything you need is already attached to the Pao Papoose. There are no extra clips or straps needed for when your baby gets bigger or if a different person is wearing it. Let’s be honest, any extra accessories end up in the Black Hole of your home and won’t re-emerge until your child is about 10 years old and has long outgrown a baby carrier. I’ll admit that the first time I got the Pao Papoose out of the box I was pretty confused but within minutes I had it on and was wearing George comfortably. Don’t let the straps and clips put you off, it’s really simple to put on and easy to get the baby in and out. The instructions the Pao Papoose comes with are really cute and easy to follow. There are character-led illustrations to make it nice and simple. OK, I know baby slings are unisex but I’ve never seen a man wearing a baby sling and there’s no way in the world I’d get Sam to use one. Sam and I both love wearing the Pao Papoose. I read that on the website. I hadn’t realised there was an ergonomically correct seating position for a baby but it’s good to know George is in it. What I do know is that George is comfortable and well supported and his back is straight. I actually think it helps me keep my back straighter too so it’s a winner for both of our postures. This might seem irrelevant but seriously, the packaging for the Pao Papoose is really gorgeous. They suggest keeping the tube as a beautiful keepsakes box. Yes, it’s THAT nice. Anything I don’t like about the Pao Papoose? When you’re wearing the Pao Papoose it doesn’t feel big at all but when you don’t have it on it seems pretty bulky. You can’t just fold it up and pop it in your bag like you would with a sling. It takes up about ¾ of George’s changing bag. Not a biggy but it would be much nicer if they were black. The Pao Papoose is currently priced at £89.99. It isn’t cheap but it can be worn from when your baby is only 2-3 months until they’re far too big to be carried anyway so you’re going to get your moneys worth. Would I recommend the Pao Papoose to a friend? 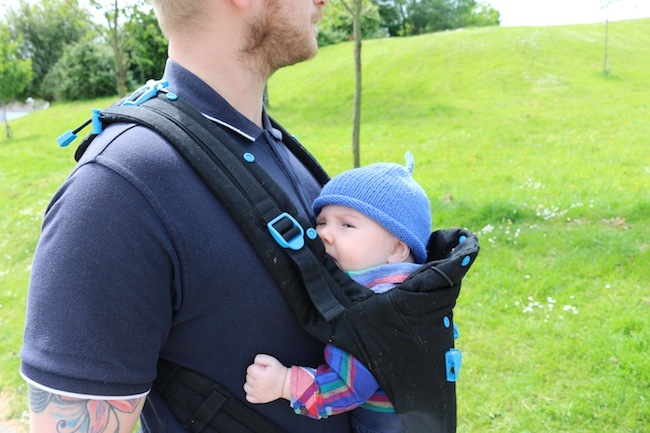 I’d recommend the Pao Papoose for couples who want to share baby carrying and want a simple, easily adjustable, comfortable and stylish carrier. Big thanks to We Made Me for supplying me with the Pao Papoose for the purposes of this review. And thanks to George and Sam for being fabulous models! I would not recommend this carrier at all. We bought this specific one because it makes it possible to carry your child facing forward (which is what she likes). We foolishly bought it without trying it. – It is a hassle to put on. It takes at least 10 minutes. Adjusting it is impossible, since the tails to adjust it with are on your back. Also, the tails turn, so you never know whether you’ve got it straight or not. A tail that is turned makes it impossible to adjust the carrier. Next to this, when the clips touch, adjusting it any further becomes impossible. A woven carrier takes me 3 minutes, adjustments included. – Our daughter never seems to sit correctly in it, whereas in the woven carrier she always sits beautifully. – We have the sand coloured one, which turns out not to have been the best choice. Black would have been better. Indeed, the blue clips are quite hideous. – folding it is quite a hassle, too. – it is quite big when folded. …and, it is only half ergonomic. There is no true M-shape of the legs, and the child isn’t supported from knee to knee. I now also know that facing forward is never ergonomically sound. It puts huge pressure on the back and legs. So we never do that anymore. We now carry her on our backs, which indeed is a little bit easier with this carrier, but still not great. The carrier is to big for me, meaning the strap across the chest suffocates me. It just shows that whenever possible you should go to a baby sling library to try them out because we have the opposite thoughts. We’ve just got back from a weekend in Barcelona with our second baby and we used the Pao Papoose all weekend and, if possible, love it even more now. I’ve never got on with more traditional woven carriers as there just seems to be too much material and they take me a long time to put on. But it just shows that everyone is different with different body types and different babies. Good job there are so many options out there! I’d agree on the sand coloured point though – we have the black and even that gets filthy. It is easy to wash but takes a long time to dry and as I use ours every day it’s tough to find the opportunity!